When Compete.com launched with credits-based pricing well over a decade ago I felt like a kid in a candy store using their competitive research tool. Recently Compete.com announced they were shutting down, but many of the link analysis & competitive research tools which leverage scraping have also started licensing clickstream data from sources like Clickstre.am & JumpShot. These sorts of features add a lot of value to traditional keyword tools, as they can highlight the CTR on ads vs organic results & show if people click on anything after they search for a particular term. In that image you can see how the feature displaces the result set. What's cool about the Ahrefs feature is you can also see what sort of impact that feature has on click volumes. 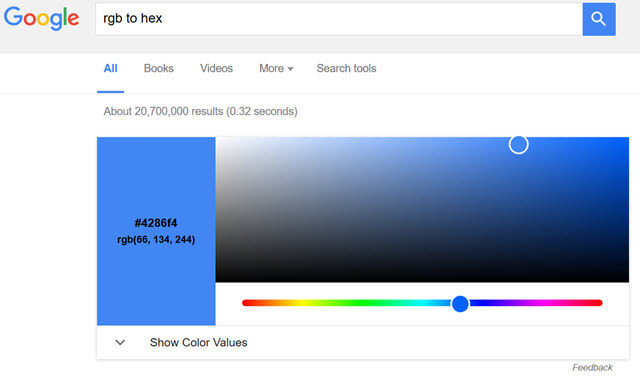 After 1 month, 20% of the searches for [RGB to HEX] no longer had any clicks to an external website. 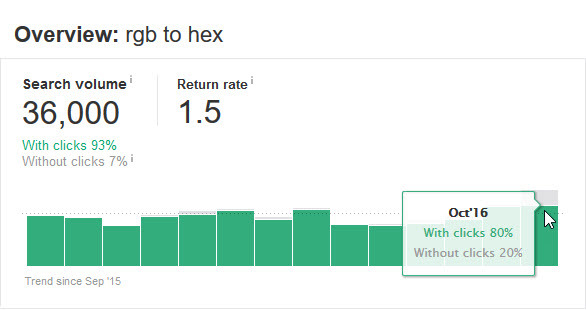 On the second month it looks like the "no click" rate was closer to 7%, so perhaps some of the initial additional search volume was driven by people searching for the related keywords after blogs covered the new feature. But the nice thing about the feature is you can see how the click rate changes over time as the feature evolves. In some areas like weather Google ends up dominating most the user behavior with their in-SERP feature. About half of all weather keyword searches do not click on any listings. And then of those which do click, about 20% of people click on an ad. That means the potential organic click volume for that keyword is only about 40% of the initial search volume estimates. Here is a new item comparison feature table. As more of the value chain appears in the search results, more of the value chain which formerly appeared on websites disappears. This is true from a wide range of aspects including ad sales, content hosting, ad blocking & brand value. No click into the publisher's site means no ad revenue for the publisher. Voice search will only accelerate the declines seen from mobile, which shifted user attention away from large screens with many listings to smaller screens with fewer listings & a far higher ad ratio in the search results. Google has already pushed hard to make hotel searches a pay-to-play vertical & yet some publishers are adopting AMP formatting in that vertical. Google is also forcing AMP down publisher's throats in other verticals like recipes. If central ad networks host your content then they get better user data for your content than you do as a publisher. Increased user tracking depresses premium ad sales & moves value from niche players to broad networks "Whether it’s a third party like Facebook or Google tracking across the web or an ISP leveraging its distribution arm, this is outside of consumer expectations. Importantly to the digital media industry, it also devalues the context and relationship of consumer trust which drives the businesses of premium publishers." Some large sites like Google or Facebook either pay ad blockers or technically work around them within their apps. By funding ad blockers exempting the search result page from having their ads blocked, Google is ultimately defunding competing ad networks. As search results get noisier & more ad heavy, Google is trying to coerce brands into re-buying their pre-existing brand equity. These efforts are effective, as on some branded & navigational searches over half the click volume goes to the ads. Here are a few examples from Ahrefs. The orange bar shows what percent of the SERP clicks are on ads. Google Maps being an ad-heavy search engine. the Google Trips app which prevent searches from happening on Google. 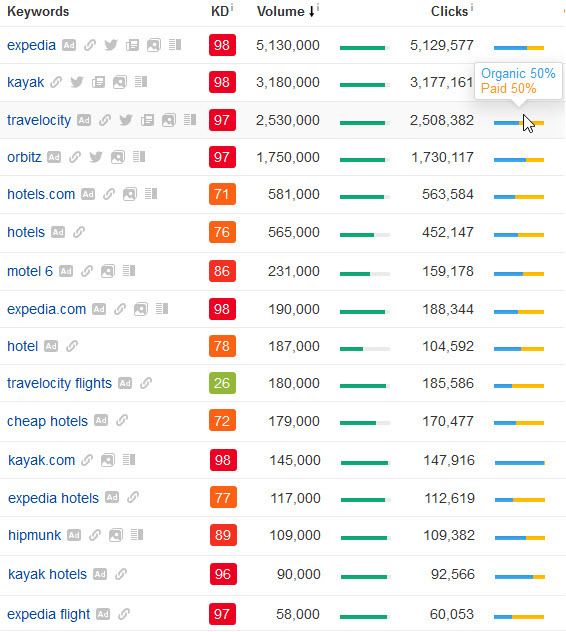 The mid-tail of travel search on mobile where Google does away with the concept of organic search results. 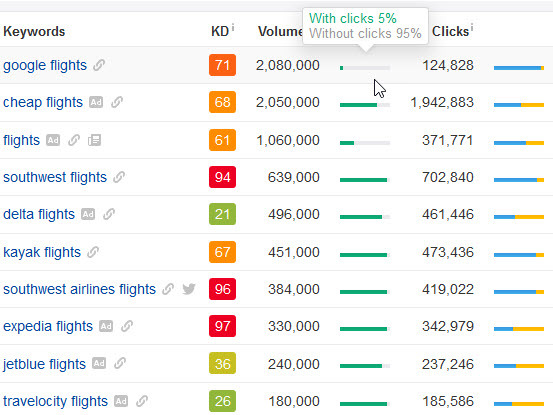 Direct booking features complementing traditional AdWords ads & hotel price ads. Google buying ITA Software to dominate flight search. Notice the most popular term is Google's branded term & for the generic term [flights] 72% of people don't click on any external site while 37% of the remaining 28% of searches click on an AdWords ad. And almost everyone else in that industry is stuck licensing flight data from Google, as they own ITA Software. So Google is eating the generic terms, the brand terms, and the search query pool more broadly. There's a reason Google's online travel business is over twice the size of anyone else & has their biggest advertisers seeking more sustainable & more legitimate alternatives. And some of the aggressive stuff carries over into other lines of business outside of travel. 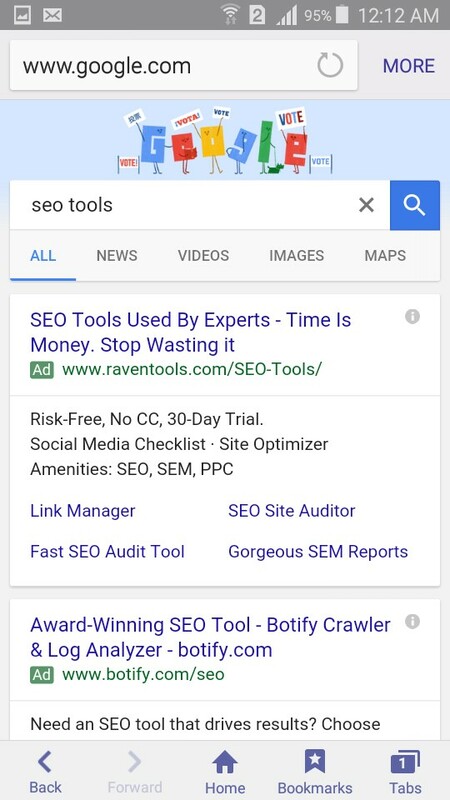 Google is also testing large image extensions on AdWords ads on cell phones that don't leave room for even a second AdWords listing on the screen. When one invests in brand they have to start thinking about how much they are willing to pay Google as an ongoing tithing for their success. Look at the following ads where a competitor bidding on a competing brand drives the brand owner's official site below the fold. 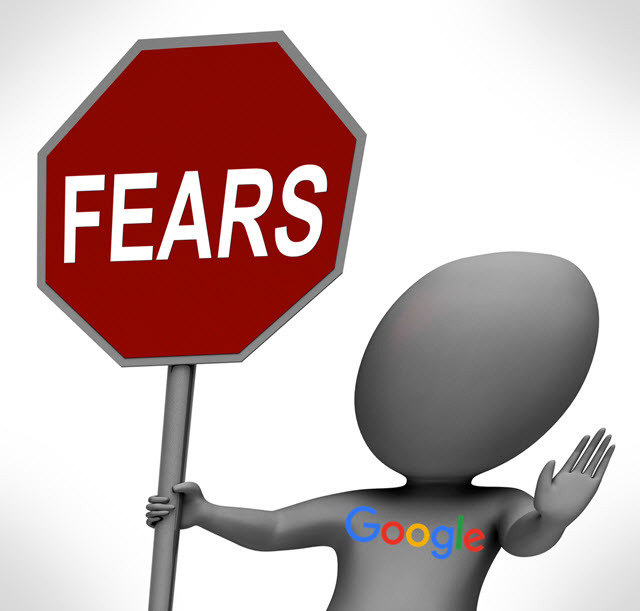 Google is willing to make their results worse (to the point they would consider something that looked like their search result page as an ad-heavy doorway redirect page of spam if hosted by anyone other than themselves) in order to monetize navigational searches. What's more, you can't just opt out & ignore. When brands make agreements to not cross-bid Google has the FTC sue them. On some high end fashion brands Google lists shopping ads which lead to third party sellers who sell used goods. Quite often counterfeits will also be in the mix. When the counterfeits are destroyed in the first wash, it is the brand owner who was took to the cleaners. But there's a solution to that... they can pay Google ever-increasing protection. Remember the whole shtick about good, legitimate, high-quality content being created for readers without concern for search engines - even as though search engines do not exist? I'd like to tell you that I was preparing the launch of https://amp.secured.mobile.seobook.com but awareness of past ecosystem shifts makes me unwilling to make that move. If you are an undifferentiated publisher without much in the way of original thought, then jumping through the hoops make sense. But if you deeply care about a topic and put a lot of effort into knowing it well, there's no reason to do the arbitrary hoop jumping. Google indicated their interstitial penalty might apply to pop ups that appear on scroll, yet Google welcomes itself to installing a toxic enhanced version of the Diggbar at the top of AMP pages, which persistently eats 15% of the screen & can't be dismissed. 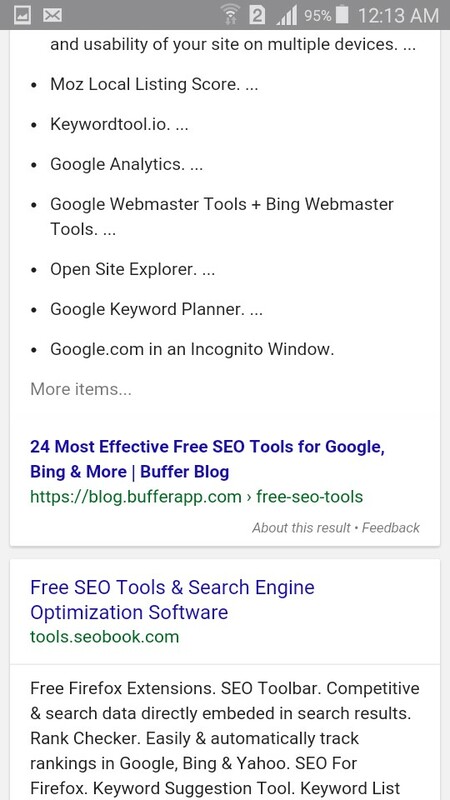 An attempt to dismiss the bar leads the person back to Google to click on another listing other than your site. As bad as I may have made mobile search results appear earlier, I was perhaps being a little too kind. 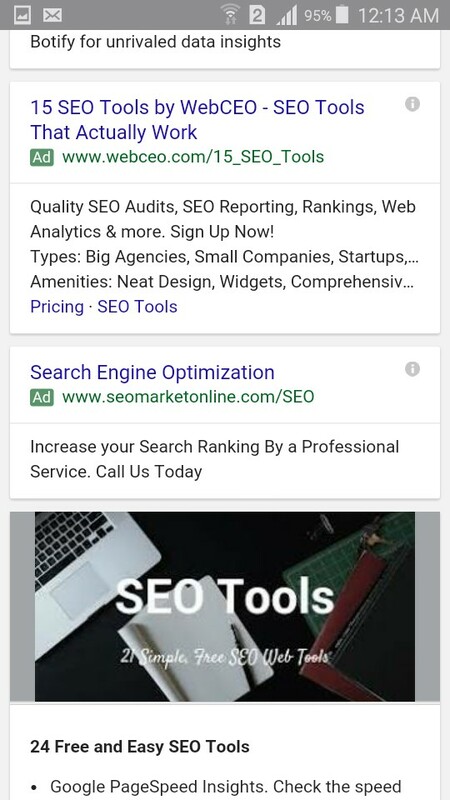 Google doesn't even have mass adoption of AMP yet & they already have 4 AdWords ads in their mobile search results AND when you scroll down the page they are testing an ugly "back to top" button which outright blocks a user's view of the organic search results. What happens when Google suggests what people should read next as an overlay on your content & sells that as an ad unit where if you're lucky you get a tiny taste of the revenues? Many people new to SEO likely don't remember the importance of using Google Checkout integration to lower AdWords ad pricing. It could be like Google's authorship. Hugely important & yet utterly trivial. Or it could be like Google Reader. A free service which defunded all competing products & then was shut down because it didn't have a legitimate business model due to it being built explicitly to prevent competition. With the death of Google reader many blogs also slid into irrelevancy. When Google routinely acts so anti-competitive & abusive it is no surprise that some of the "standards" they propose go nowhere. Google is the type of "partner" that conducts security opposition research on their leading distribution partner, while conveniently ignoring nearly a billion OTHER Android phones with existing security issues that Google can't be bothered with patching. This 2016-to-2017 Transition is going to move us from systems that are explicitly taught to ones that implicitly learn." ... the engineers might make up a rule to test against—for instance, that “usual” might mean a place within a 10-minute drive that you visited three times in the last six months. “It almost doesn’t matter what it is — just make up some rule,” says Huffman. “The machine learning starts after that. Google launches "free" services with an ulterior data motive & then when it suits their needs, they'll shut it off and leave users in the cold. Just look at Google's quarterly results for their current partners. 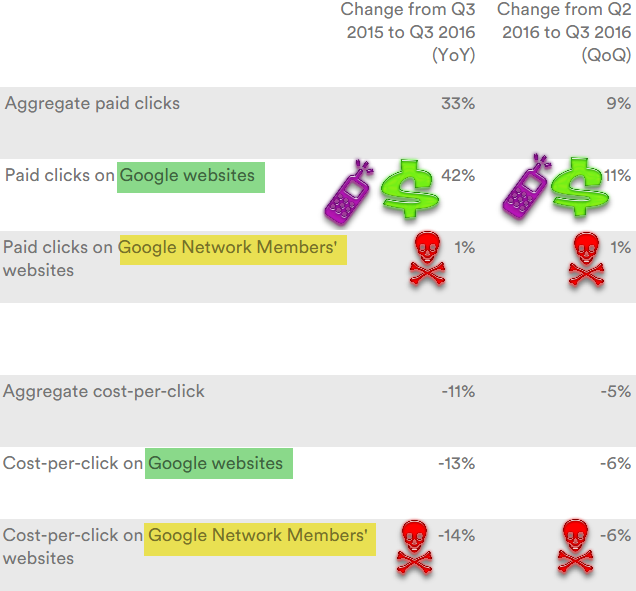 They keep showing Google growing their ad clicks at 20% to 40% while partners oscillate between -15% and +5% quarter after quarter, year after year. In the past quarter Google grew their ad clicks 42% YoY by pushing a bunch of YouTube auto play video ads, faster search growth in third world markets with cheaper ad prices, driving a bunch of lower quality mobile search ad clicks (with 3 then 4 ads on mobile) & increasing the percent of ad clicks on "own brand" terms (while sending the FTC after anyone who agrees to not cross bid on competitor's brands). If news organizations of that caliber can't get the numbers to work then the system has failed. The Guardian is literally incinerating over 5 million pounds per month. ABC is staging fake crime scenes (that's one way to get an exclusive). The crumbling of the American dream is a purple problem, obscured by solely red or solely blue lenses. Its economic and cultural roots are entangled, a mixture of government, private sector, community and personal failings. But the deepest root is our radically shriveled sense of “we.” ... Until we treat the millions of kids across America as our own kids, we will pay a major economic price, and talk of the American dream will increasingly seem cynical historical fiction. Singer Don Henley said Pallante's ouster was "an enormous blow" to artists. "She was a champion of copyright and stood up for the creative community, which is one of the things that got her fired," he said. ... [Pallante's replacement] Hayden "has a long track record of being an activist librarian who is anti-copyright and a librarian who worked at places funded by Google." Although our search index will continue to be a single index of websites and apps, our algorithms will eventually primarily use the mobile version of a site’s content to rank pages from that site, to understand structured data, and to show snippets from those pages in our results. Of course, while our index will be built from mobile documents, we're going to continue to build a great search experience for all users, whether they come from mobile or desktop devices. There are some forms of content that simply don't work well on a 350 pixel wide screen, unless they use a pinch to zoom format. But using that format is seen as not being mobile friendly. Imagine you have an auto part database which lists alternate part numbers, price, stock status, nearest store with part in stock, time to delivery, etc. ... it is exceptionally hard to get that information to look good on a mobile device. And good luck if you want to add sorting features on such a table. Once again money drives search "relevancy" signals. Amazon converts well on mobile in part because people already trust Amazon & already have an account registered with them. Most other merchants won't be able to convert at anywhere near as well of a rate on mobile as they do on desktop, so if you have to choose between having a mobile friendly version that leaves differentiated aspects hidden or a destkop friendly version that is differentiated & establishes a relationship with the consumer, the deeper & more engaging desktop version is the way to go. When these ad networks are strong & growing quickly they may be able to take a stand, but when growth slows the stock prices crumble, data security becomes less important during downsizing when morale is shattered & talent flees. Further, creating alternative revenue streams becomes vital "to save the company" even if it means selling user data to dangerous dictators. Data is being used in all sorts of crazy ways the central ad networks are utterly unaware of. These crazy policies are not limited to other countries. Buying dog food with your credit card can lead to pet licensing fees. Even cheerful "wellness" programs may come with surprises.